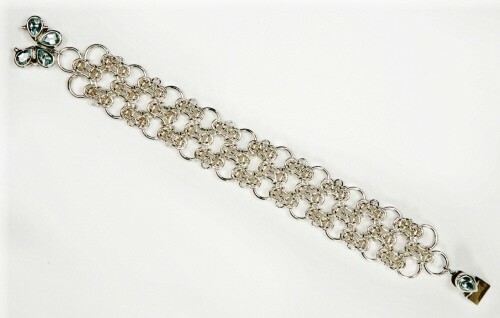 The Byzantine and Circles Bracelet is a wonderful variation of the byzantine weave. It is a larger bracelet for those who prefer more substance on the wrist. The airiness that the large rings give the byzantine weave cause this to be a very interesting bracelet to make and wear. It is an intermediate project. The clasp is not included.